When we bought our house there were a few things that were on my "must change" list. The kids' bathroom was near the top of that list. 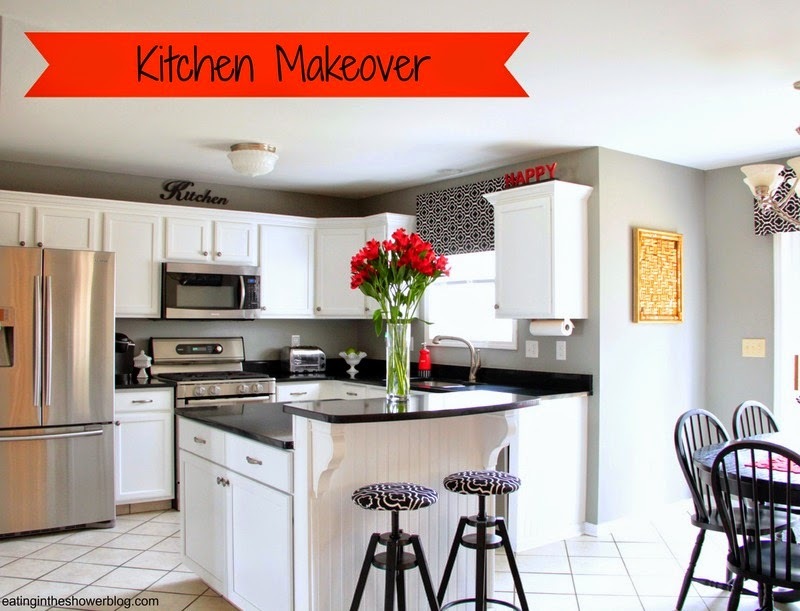 I wanted to change the paint color from the too- close- to- margarine shade of yellow, replace the worn vinyl floor, add board and batten trim, upgrade the oak vanity and top, and change the fixtures. Keeping in mind that we are a military family and whatever I did, another family would end up enjoying (or hating), I compromised a bit to keep the cost from skyrocketing. It's a tiny space so I wanted to make it bright, fun, and try something that might not work in a larger room. 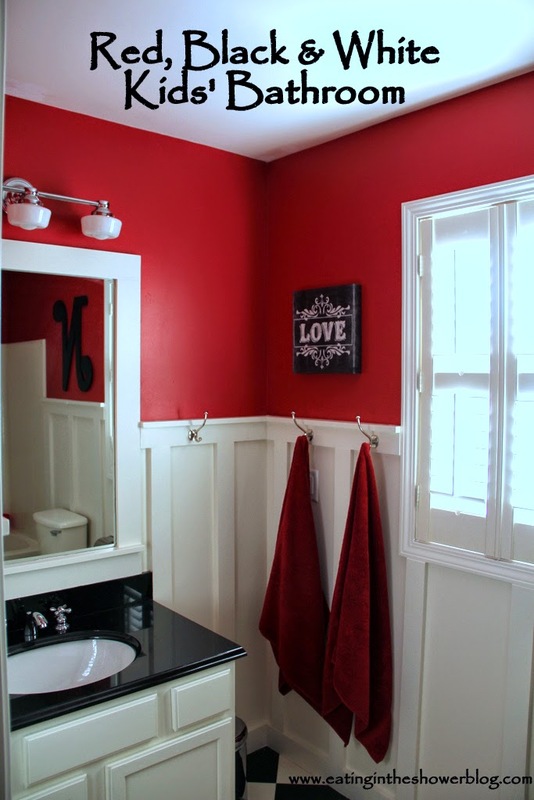 I knew I wanted the walls to be red and loved the look of black and white tiles for the floor. We found black and white vinyl sheet flooring in a diagonal pattern that looks as sharp as tile, cost much less, and requires little more than a damp mop to keep squeaky clean. I'm not sure how I could ever put grouted tile in a kids' bathroom after having it! The wall color is Ralph Lauren Stadium Red. In some light it looks almost maroon and at other times, a bright fire engine red. I searched for months to find the cross handle faucets that I was after but seemed to cost way too much everywhere I looked. I also shopped around quite a bit before choosing the three light schoolhouse vanity fixture. A key factor in the DIY process around here is that whatever I dream up, my husband finds a way to create. He used a large sheet of mdf cut into four inch wide pieces and created what I think is an amazing board and batten look and painted it Acadia White by Benjamin Moore. He refinished the oak builder grade vanity in the same smooth white and framed the existing mirror to tie in with the rest of the trim. I can't say enough good things about Acadia White for trim. It's just a beautiful white that reminds me of cream. The above photo of the bathroom under construction doesn't come close to showing how unattractive the shade of yellow on the walls was before they were red. It was a stubborn, horrible yellow that didn't want to be covered- even by a dark red paint. Notice in the photo below how the yellow shows through! The before shot of the oak vanity was taken with my cell phone when we were looking at the house. My hand was probably shaking because the yellow paint was causing me stress. Changing the vanity top and sink out with a black granite top made for such a great contrast with all of the creamy white. We haven't added any hardware to the drawers mainly because I can't make up my mind about bin pulls. I like the sleek look of it the way it is. 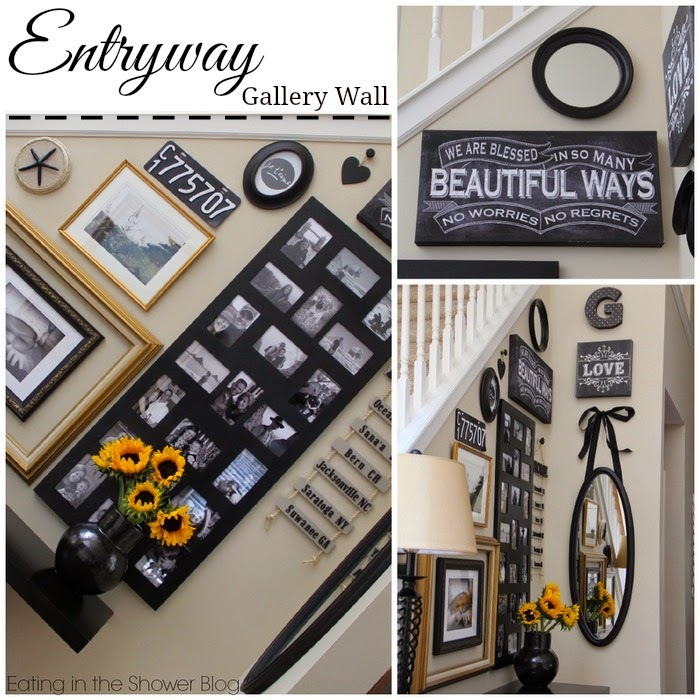 I thought about adding some photos of the baby splashing in the tub but since we knew we were going to be showing the house in the near future, I didn't want to hang too many personal photos and instead went with bold black accents on the wall. Overall, I'm so happy with the way the remodel turned out. It's a unique look and makes a huge impact in such a tiny space. I will miss this little room when we have to leave. Sigh. Love how this turned out! The color combo is just great, and love the finishing touches. I just bought a kitchen faucet last week and had ticket shock too! I need to do my bathroom over as it is really in need of it. I have been putting it off too long. Thanks for spurring me on! So far- but he's too little to really get it dirty. We'll see! Thanks Linda! 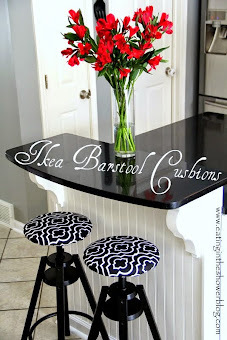 I just joined your Nifty Thrifty Tuesday party at Coastal Charm. Love your beautiful site. very cute .love the colors! 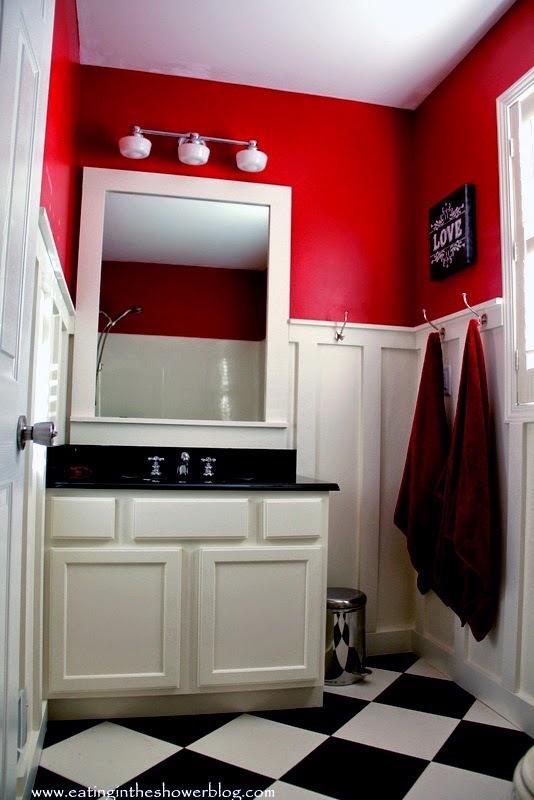 Love the red, white and black bathroom. Too cute. Featuring it at Wow Us Wednesdays tonight. Welcome to blogging, too. Kim, that is fantastic news! Thank you so much. I'm loving the party at Savvy Southern Style. Really impressive makeover! I love your colors! I would love to have you share it at the Rock N Share! just beautiful! I love the red ! It all goes wonderfully together! I love that! Red is my FAVE! Congrats on the Savvy Southern Style feature. that is a biggy! What manufacturer makes that floor? 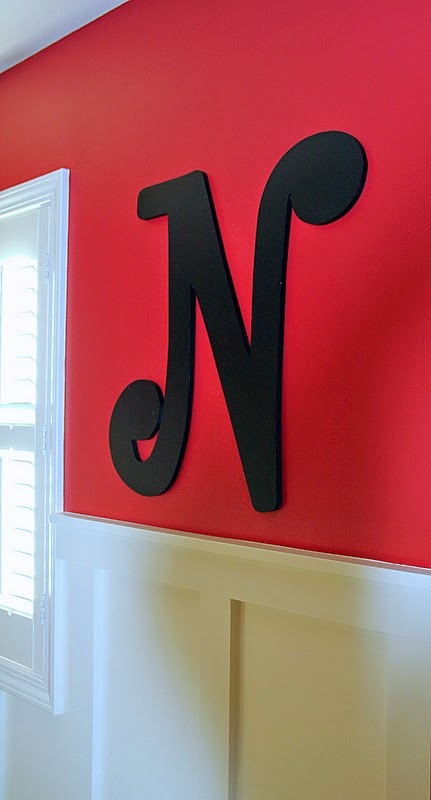 I just have to have for my boys' bathroom. Love it! You made it look so expensive. Thanks Kelly! The flooring is Armstrong Cushionstep Vinyl. Wow so much fun! I love all the retro touches ;) Thanks so much for linking up to Give Me The Goods Monday! Kate, your bathroom looks amazing! The red paint with the black and white tile looks SO good. I'd love to feature this on my paint color blog. You wouldn't have to do a thing, just let me know if you're interested! Thanks so much! Love your site Jena! Love love love this bathroom!! Saw you featured over at Brenda's...your newest follower:) Stop on by when you have a chance. LOVE the light fixture over the sink! Where did you find such a beautiful fixture? What a great job. It looks amazing! The sheet of mdf was about 30$ at Lowes and we had them cut it for us. Score! Such a cute bathroom! I love it! Love the red!!! Such a stylish transformation! It is a good way to make an impact in a tiny space. Home decor is what you make it and you've done well by combining strong elements. The red will help to hide hand prints and dirt. I think that other warm shades would have worked well too. Contrasted well with the tile. tremendous display of creativity. You couldn't have done it better. I am going to try similar concept for my kids bathroom. Nice color contrast. Plus like halle rose said dark color will help hide stains and dirt. Loving it ! Thank you so much! Share pictures of your bath when you get finished and have fun! What is "Better" When Taking Photos? A Stone, A Leaf, A Circus Tent? 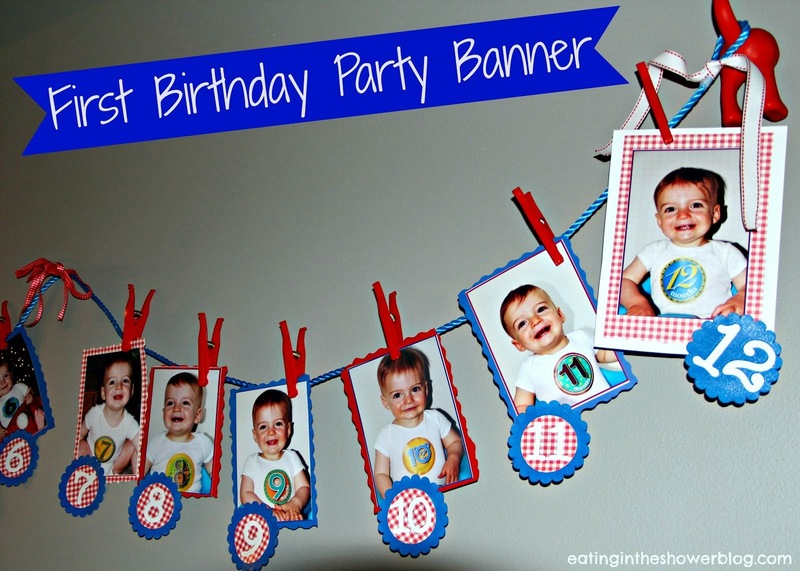 Party Planning 2.0: Why do Babies Have to Grow?